ALBANY, New York (WABC) -- Some New York State lawmakers are hoping to halt an upcoming tax on plastic bags in New York City. 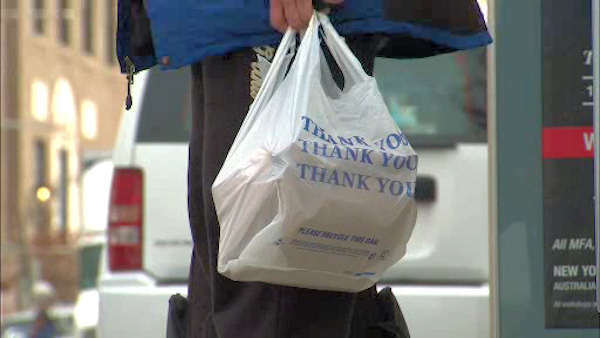 The five cent fee for disposable shopping bags is scheduled to take effect on Feb. 15th. New York State Senators Simcha Felder, Martin Golden, and Tony Avella and Assemblyman Michael Cusick joined colleagues on both sides of the aisle at a news conference Sunday at City Hall to discuss their efforts to stop the tax. They say there is still time to stop the Mayor and City Council from implementing it. Critics argue the tax is a bad deal for working and middle class New Yorkers. The City Council passed the law to cut down on single use plastic bags, which are rarely recycled and end up as trash in landfills.